Want to plan your budget weekly or bi-weekly in advance? 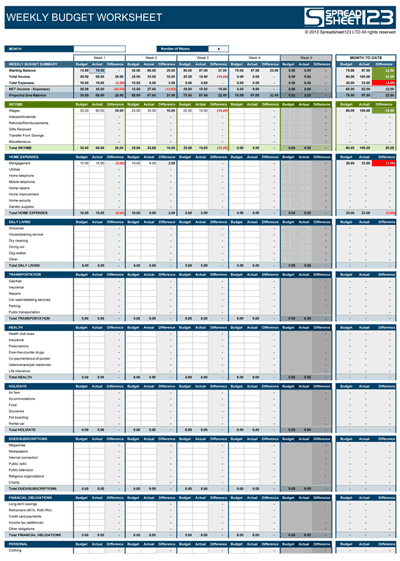 Weekly Budget Template helps in allocating the budget for the one week or bi-weekly for various expenses at the start of week and then calculates the difference at the end of the week or even at the end of the month. You can allocate the budget for a week or bi-weekly and record the actual amount being used against each category during the week. This difference of the allocated budget and the actual budget incurred gives the total expense incurred. One can easily allocate budget for a category of the expense and record the actual cost incurred for that category during the number of weeks in the month it may vary between 4 or 5 weeks. The cost of each kind of expenditure is populated to calculate the weekly projected end balance. The spreadsheet records the entries for all sorts of payments or expenses that you may incur. 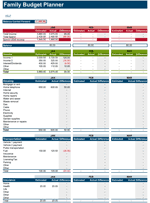 We recommend you to update this sheet regularly for monitoring the actual cost incurred against the budgeted cost in order to correctly calculate the weekly budget. The expenses section records different kinds of expenses incurred such as Home, Daily Living, Transportation, etc. 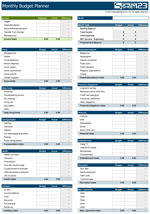 The Bi-Weekly spreadsheet provides the summarized budget bi-weekly and also calculates the budget and expenditure incurred for all the four weeks. Disclaimer - The spreadsheet and information on this page is intended for educational an illustrative purposes only. Use information at your own risk. It is strongly advised to consult the qualified professionals regarding financial decisions. The sheet provides a weekly budget summary table that provides the details of the Starting Balance, Total Income and Total Expense and the net income and expense details. You can also get a detail of the projected end balance and the difference between the two. The set budgets for each kind of expenditure that one needs to achieve in order to have a good budgeting. The net value of each sub table is calculated separately. The weekly and bi-weekly analyzes helps to get a better idea of the overall budget targets that a person sets and the amount that he/she is able to actually save. It also helps to take better decisions on your weekly and bi-weekly savings and expenditures. The template also provides the details of Month to Date income and expense values. The Projected End Balance of difference for the current week is carried forward as the Starting Balance of the following week. 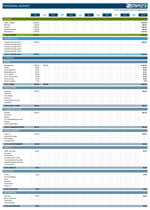 The Bi-Weekly spreadsheet gives the summary of the Budgeted Amount and the Actual Amount on a bi-weekly basis. The Net Projected End Balance for the all the weeks of the current week is also calculated automatically in this spreadsheet. The Net Balance is calculated by subtracting the Total Expense from the Total Income and adding the Starting Balance to it. What does the "Projected End Balance" value mean? The Projected End Balance is the amount of money you can save in a week from your income. The value would be achieved if the budgeted goals have been attained for the expenses that are incurred during the week. What is the importance of a Weekly budget? Weekly Budget Plan helps in achieving your savings targets. The expenses can be assessed on a daily basis and a decision could be taken immediately to avoid any unnecessary expenses that would hinder the process of saving or would hamper your budget in a long run. It helps you to have a control over your financial future and makes you secure. 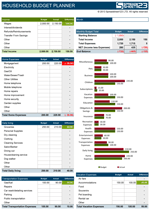 YouNeedABudget.com - Advanced budgeting and professional advise, try it if you need something more than excel. You can also get $6.00 discount by clicking on the link. MoneySavingExpert.com - The Budget Planner: Free tool and guide to managing your money. How to make a Personal Weekly Spending Budget? What is the importance of planning a monthly budget? While Budgeting what mistakes need to be avoided?